Hans Erni (1909-2015), the famous Swiss graphic artist, died on 21 March 2015, a year ago this month. He made it to the grand age of 106. You would like to see some of his work? I can't show you any, at least not without risking a serious legal complaint. If you don't believe me, see what you can find on Wikimedia. Good luck. Erni's work seems to be in lockdown. It has disappeared into museums, only to be seen by visitors. 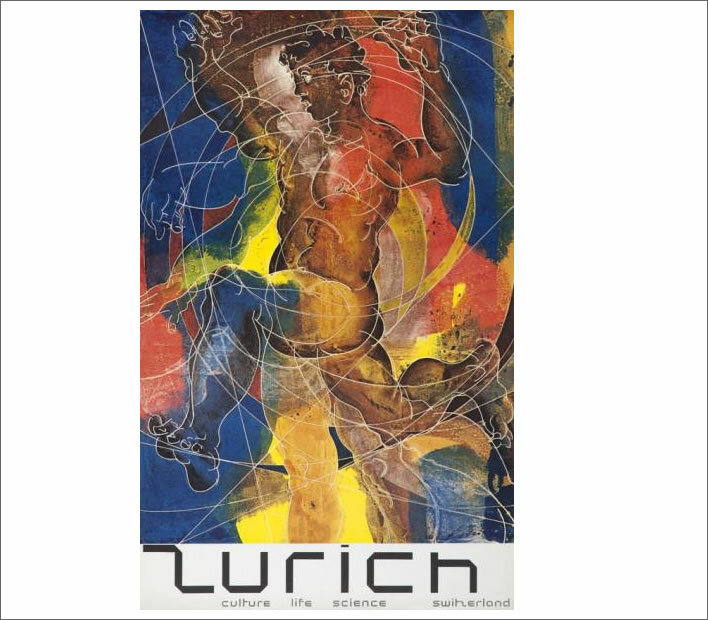 There is, for example, the Hans Erni Museum in the Verkehrshaus (Swiss Transport Museum) in Lucerne, which currently has around 380 of his works. The entrance fee – admittedly to the whole museum – is 30 Francs: kerrching! The works in all of these collections can only be viewed in person and after money has changed hands. Don't try to photograph them. If you publish the image on the postcard you bought in the shop you will be in trouble. Not a single image of his work is available on the museum's website, the best you get is a photo of the building. His massive (91m x 5m) work 'Die Schweiz, das Ferienland der Völker', a fascinating and highly detailed mural that he painted for the Swiss National Exhibition of 1939 is in pieces in the Swiss National Museum in Zurich. It was paid for largely by public or semi-public funds. After the exhibition the 136 panels of the mural were kept in a warehouse belonging to the Swiss Federal Railways for fifty years. The entire mural was displayed a couple of times in the early 1990s then went into storage at the Swiss National Museum. Between 2003 and 2006 the conservation experts at the Swiss National Museum have rescued Erni's mural from sixty years of decay and maltreatment. On account of its size the chances of the mural ever being displayed in its entirety are slim, but various combinations of panels may be exhibited here and there. There is a study of the mural here. As for his other works, the museum offers online two poor quality, low resolution photos of two mediocre, minor works. Entrance 10 Francs: a very modest kerrching! For an exhibition in the Museum of Art in Lucerne to celebrate Erni's 100th birthday in 2009 a few pieces of the mural reappeared. As usual, the website of the gallery shows us little of his work, apart from one self-portrait. There are seven pieces in small sizes in the online collection. If you want to see more you have to buy the catalogue: 58 Francs – kerrching! 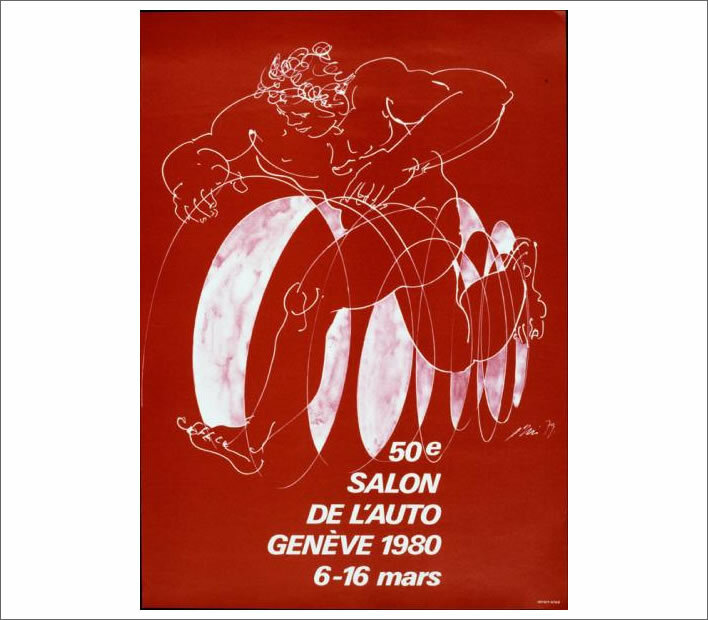 Hans Erni, 'Salon international de l'automobile, Genf', 1980. Archive Number: 35-0013. The running man, a classic Erni motif. The eco-warrior seemingly happy to work for the Geneva Motor Show, even in 1980. Hans Erni, 'Zurich' Verkehrsverein Zürich (Tourist Office, Zurich), 1968, Archive Number: 41-0961. All the classic Erni elements: the circles and ellipses and the running man, this time with Vorticist strobe effect. Hans Erni, 'save our water', 1961, Archive Number: 06-0604. Erni in eco-warrior mode. A rather facile juxtaposition of images without unifying elements. Hans Erni, 'Gesellschaft Schweiz-Sowjetunion' (Swiss-Soviet Union Society), 1945. Archive Number: 07-0860. Erni the communist supporting the Soviet Union in 1945. 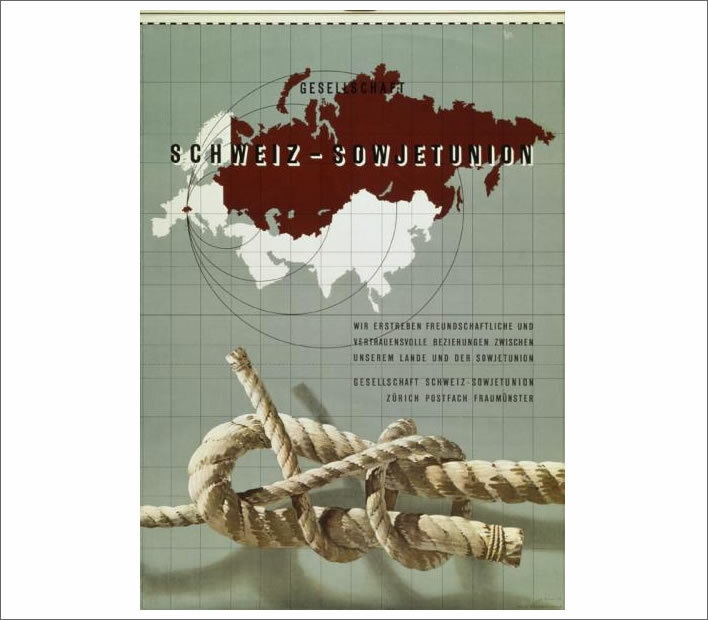 The tiny dot that is Switzerland disturbingly insignificant compared to the huge size of the Soviet Union; the thin rope knotted around the thick rope. You might expect hans-erni.ch, the 'official site of the Erni family' to show a few of his works – it is the website of a well-known artist, after all. It is estimated that he left around 13,000 works altogether, so there can hardly be a shortage. No, there is not one work on the website, just a few mood panels. The site says it is 'responsible for all questions concerning the artist Hans Erni such as the authentication of works, press relations, communication and marketing'. All very artistic. We get the impression that Erni is now just a brand to be marketed like any other. We assume that the serious financial interests in his work will continue the lockdown as long as they can. Copyright protection in Switzerland exists for 70 years after the creator's death, which means that, unless there is a change of heart by the copyright owners, you will finally be able to view his work freely from 22 March 2085. Until then there will be an internet – or whatever it will be in 2085 – blackout of his work. By that time he will have been forgotten. In the internet age the lockdown is a shortsighted measure that will undoubtably be a bad thing for Erni. His star has already faded considerably. It says a lot that a Wikipedia entry for a graphic illustrator who became arguably the most famous artist in Switzerland and whose main work any half-educated Swiss person can recognise does not directly show a single one of his works. The only thing that the custodians of Erni's work seem to be interested in is getting you through the door: kerrching! We like irony on this blog, as our readers know. The foundation and the family now sitting on a pile of cash and possessions are the beneficiaries of the lifetime's work of a dedicated anarcho-communist who embraced every left-wing and eco obsession throughout his life. Proudhon's famous remark that 'property is theft' and Marx's principle of common ownership are clearly no obstacle to a long life spent accumulating property and money and extracting money for viewing art. We are not surprised that Erni's biography on his website mentions not a word of his communism – he was, after all 'never a member of the party'. He lived through the horrors of Stalin and Mao and said not a word against these monsters, who killed so many millions. It is true that, after the Hungarian uprising was brutally crushed by the Soviets in 1956, he had another little think about his politics, changing over time from red to green. During his lifetime the communist Erni was happy to carry out commissions from large corporations: he apparently felt no contradiction in accepting lucrative commissions from the chemical company CIBA, the Swiss Watch Council, the Container Corporation of America, Nestlé, various Swiss banks and numerous insurers such as the Swiss Reinsurance Company, in short, anyone who was anyone in global capitalism. The frequently mentioned 'ostracism' he suffered at the hands of the Swiss government from 1938 to the mid-sixties has left no trace in the steady flow of commissions he undertook during that period. True, in his later years, when the money pit had been well and truly filled, his sponsers, large, cash-rich agencies such as the UN, the WEF and so on, brought it to overflowing. He followed the green money trail with great success. In 2007 for the private-jet passengers and helicopterists at the World Economic Forum (WEF) in Davos his works on the theme of global warming were centre stage. 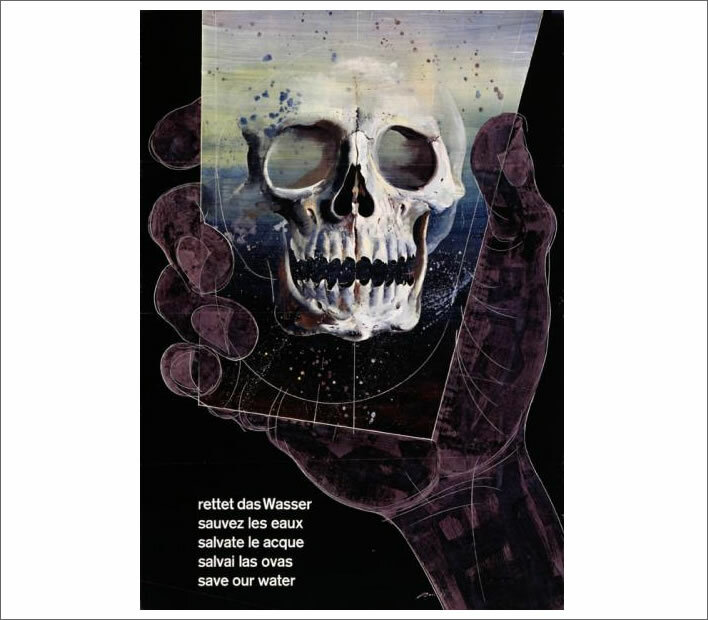 He even produced illustrations for an edition of Jean-Jacques Rousseau's Les Rêveries du promeneur solitaire	placing him firmly in the Great Zombie's club of green totalitarians. Tellingly, we find him on his 100th birthday in the company of one of Jean-Jacques' modern friends, the eco-liar Moritz Leuenberger. 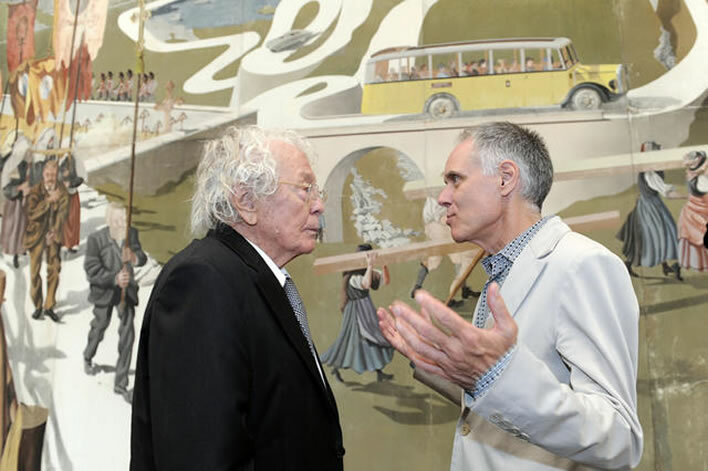 Hans Erni in conversation with Moritz Leuenberger on the occasion of his 100th birthday at an exhibition in the Museum of Art, Lucerne. in 2009. Image Luzerner Zeitung. Thus, in one great final irony, the anarcho-communist's artistic legacy appears on the surface at least to be being strangled by the very capitalist forces of which he claimed to disapprove. So upsetting – perhaps karma does exist.